Description: 3 Scoops of ice cold, delicious, desert fun covered in anything you want! Pile on the sprinkles, candies, chocolate, fruits, cherries and more in this sweet treat of a game. 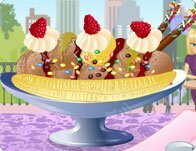 Instructions: Use your mouse to click on the floating Ice cream treats, colors and toppings and make your self a delicious 3 scoop sunday complete with sprinkles, candies, chocolates, fruits, whipped cream, icing and more! Nothing's more delicious than an ice cream sundae you can make yourself!